In basketball, free throws or foul shots are unopposed attempts to score points from a restricted area on the court (the free throw line; informally known as the foul line or the charity stripe), and are generally awarded after a foul on the shooter by the opposing team. Each successful free throw is worth one point. Free throws can normally be shot at a high percentage by good players. In the NBA, most players make 70–80% of their attempts. The league’s best shooters (such as Steve Nash, Rick Barry, Ray Allen, José Calderón, Stephen Curry, Reggie Miller, Kevin Durant, and Dirk Nowitzki) can make roughly 90% of their attempts over a season, while notoriously poor shooters (e.g. Dwight Howard, DeAndre Jordan, Wilt Chamberlain, Andre Drummond, Ben Wallace, Shaquille O'Neal, and Dennis Rodman) may struggle to make 50% of them. During a foul shot, a player's foot must be completely behind the foul line. If a player lines up with part of his or her foot on the line, a violation is called and the shot doesn't count. Foul shots are worth one point. The second is when the fouling team is in the team bonus (or foul penalty) situation. This happens when, in a single period, a team commits a set number of fouls whether or not in the act of shooting. In FIBA, (W)NBA and NCAA women's play, the limit is four fouls per quarter; in the NBA, starting with the fifth foul (4th in overtime), or the second in the final 2 minutes if the team has less than 5 fouls (4 in OT), the opposing team gets two free throws. In the WNBA, the fouled player shoots two free throws starting with the opponent's fifth foul (4th in overtime), or second team foul in the final minute if that team has committed under 5 fouls in a period (4 in overtime). In FIBA and NCAA women's basketball, the fouled player also shoots two free throws starting with the opponent's fifth foul in a period, considering that team fouls accrue from the fourth period on, as all overtimes are extensions of it for purposes of accrued team fouls. In NCAA men's basketball, beginning with the seventh foul of the half, one free throw is awarded; if the player makes the free throw, another is given. This is called shooting a "one-and-one". Starting with the tenth foul of the half, two free throws are awarded. In addition, overtime is considered an extension of the second half for purposes of accumulated team fouls. Free throws are not awarded for offensive fouls (most often charging fouls), even if the team fouled is in the bonus. The number of fouls that triggers a penalty is higher in college men's basketball because the game is divided into two 20-minute halves, as opposed to quarters of 12 minutes in the NBA or 10 minutes in the WNBA, college women's basketball, or FIBA play (note that the college women's game was played in 20-minute halves before 2015–16). As in professional play, a foul in the act of shooting is a two- or three-shot foul, depending on the value of the shot attempt, with one free throw being awarded if the shot is good. If a player, coach, or team staff (e.g. doctor, statistician) shows poor sportsmanship, which may include arguing with a referee, that person may get charged with a more serious foul called a technical foul. In the NBA, a technical foul results in one free throw attempt for the other team. In FIBA play, technical fouls result in two free throws in all situations. Under NCAA rules, technical fouls are divided into "Class A" (violent or serious unsportsmanlike conduct) and "Class B" (less egregious violations such as hanging on the rim or delay of game). Class A technicals result in two free throws, and Class B technicals result in one. At all levels, the opposing team may choose any player who is currently on the court to shoot the free throws, and is then awarded possession of the ball after the free throws. Since there is no opportunity for a rebound, these free throws are shot with no players on the lane. Finally, if a referee deems a foul extremely aggressive, or that it did not show an attempt to play the ball, the referee can call an even more severe foul, known as an unsportsmanlike foul in international play or a flagrant foul in the NBA and NCAA basketball. This foul is charged against the player (and depending on the severity of the offense, can even be ejected), and the opponent gets two free throws and possession of the ball afterwards. 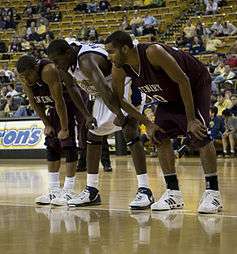 Unlike technical fouls, the player fouled must shoot the awarded free throws. Fouls "away from the ball" (fouls that do not occur on the shooter or near the ball) are handled like the second case above in most situations. Many times defenders hold their opponent to prevent them from catching an in-bound pass or fight through screens and thus are called for fouls. These fouls are almost always treated as normal personal fouls. In the NBA, when there are only two minutes left on the clock of either half, off-ball fouls when the fouling team is over the limit are rewarded with one free throw and possession of the ball. It is therefore common for a losing team to deliberately single out its opponent's poor free throw shooters, regardless of their dominance in other aspects of the game (as in the cases of Ben Wallace and Shaquille O'Neal), as the targets of deliberate fouls until the two-minute mark, after which the losing team plays intense defense for the rest of the game (see Hack-a-Shaq). It is believed that this rule was instituted because of Wilt Chamberlain. Previously teams had been allowed to foul any player on the court regardless of whether that player had possession of the ball, with only two free throws awarded to the fouled player. 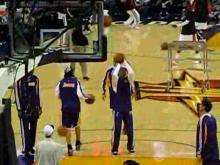 This motivated teams to chase poor free throw shooters, such as Chamberlain, around the court in attempt to foul him in an effort to extend the game. To discourage this practice, the NBA changed the rule to award one free throw and possession of the ball to a player who is fouled away from the ball in the last two minutes of the fourth quarter. This rule does not apply in international or NCAA play and in fact plays a very vital strategic role in the NCAA Tournament. Free throws are organized in procession. The shooter takes his place behind the free throw line (5.8 m (19 ft) from the base line, 4.6 m (15 ft) from the basket). All other players must stand in their correct places until the ball leaves the shooter's hands: up to four people in the NCAA rules  and three people in the FIBA rules  from the defensive team and two people from the shooting team line up along the sides of the restricted area (keyhole, paint, lane). These players are usually the ones that rebound the ball. Three line up on each side. A defensive player always takes the place closest to the basket. The remaining players must remain behind the three point line and the free throw line extended (an imaginary line extended from the free throw line in both directions to the sidelines). Prior to the 1954–55 season, the NBA established the rule that a backcourt foul would result in a "three to make two" situation (up to three attempts to make two free throws) if the violating team was over the team foul limit. By 1979, the rule had been extended to the penalty situation for flagrant fouls, fouls made in the act of shooting (resulting in a miss), and fouls due to the swinging of the elbows. Prior to the 1981–82 season, this rule, as well as the related "two to make one" rule were abolished. As mentioned earlier, some players are notoriously bad free throw shooters. Historical examples of star players who were poor shooters include Wilt Chamberlain, Ben Wallace, and Shaquille O'Neal. This allows a strategy where a team intentionally fouls this player, hoping that they will miss one or both shots and the defending team will re-gain possession of the ball. This strategy was dubbed Hack-a-Shaq when famously used on Shaquille O'Neal. Dwight Howard, DeAndre Jordan and Andre Drummond has been subjected to this strategy as well, as have other players. As well, a defensive team leading by three may foul an offensive team intentionally late in the game, if the game clock is no greater than a couple of seconds. In such circumstances, the opposing team would most likely not have enough time for multiple possessions. Down three points, the opposing team's obvious strategy would be to attempt a three-pointer to try to send the game into overtime; however, the leading team may attempt to foul the trailing team before a shot is attempted, as this would lead to only two free throws which is not enough to tie the game. 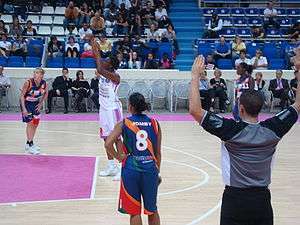 If the trailing team is placed into the situation of shooting two free throws, they must attempt to intentionally miss the second free throw in the hopes of securing the offensive rebound (which is harder than normal with free throws, as the defending team is automatically given position) and scoring before the game clock expires - if the first free throw is made, a two-pointer would tie the game, and a three-pointer would win the game; if the first free throw is missed, only a three-pointer would tie the game. Theoretically, adopting this strategy makes a leading team four times more likely to win the game than allowing the trailing team to attempt a three pointer. 1 2 Fixler, Kevin (2012-12-13). "Shooting for Perfection". SB Nation. Retrieved December 16, 2012. ↑ "The ins and outs of free throw shots". Pittsburgh Post-Gazette. 11 March 2007. ↑ "Rule No. 9-Free Throw". National Basketball Association. NBA Media Ventures, LLC. 1 2 "NBA.com: NBA Rules History". Retrieved 2011-04-04. ↑ Winick, Matt (1979). Official 1979-80 National Basketball Association Guide. The Sporting News. p. Rules Index 31. ISBN 0-89204-049-1. ↑ Silverman, Drew (2012). Kansas Jayhawks. Sportszone. p. 21. ISBN 978-1617832833. ↑ "Does Hack-a-Shaq actually work?". ESPN. April 28, 2016. Retrieved June 20, 2016. ↑ Landman, Seth. "'Hack-a-Howard' strategy in full effect". ESPN. Retrieved 21 May 2012. ↑ Lawhorn, Adrian. ""3-D": Late-Game Defensive Strategy with a 3-Point Lead". 82games.com. Retrieved 21 May 2012.